On the fiftieth day of the Lord's resurrection the Holy Spirit came down over the apostles in the form of flames and endowed them with gracious gifts. The holiday is called Pentecost, because this event happened on the day of the old-time Pentecost holiday that marked the Jews fifty days after Passover. On the St. Pentecost the evening liturgy is combined with the morning worship (after St. vespers liturgy is carried out), prayers to beg for gifts of the Holy Spirit are worthy for worship and till Pentecost as a sign of spiritual joy of worship, the worshippers don't have to kneel. The holy prokimen: "Whose God is great like ours? Thou are a God who does miracles." - From the altar entry walnut leaves are thrown to the worshippers. The leaves remind about the flames above the apostles' heads. Believers take the leaves in their homes for blessing. Holy Day of Pentecost is considered from ancient times to be the birthday of the Christ Church, established not by the vanity of human's thoughts, but from divine grace. The lithurgy will start from 8.00pm on 7.06.2009. On this great festive occasion, The Church calls the believers to give a reverent adoration to the life giving Cross, on which the Savior himself beared the sufferings for the sake of our salvation; on the Cross as a weapon of the Christ's victory over the sins and death. On the eve of Cross day - 14th of September, worshippers from near and far lands come to pray for health and prosperity during annually vigil at Cross forest in front of the newly built church "Cerement of the Holy Virgin Mary". 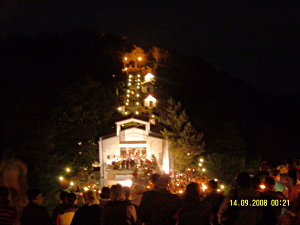 On the Cross peak, one of the large-scale gatherings in the world takes place. This event happens once throughout the year - on the night of 13th of September. At that time, tens of thousands of believers gather on the hill for a night liturgy in expectance for a miracle. The vigil ends with the sunrise when the sun's rays touch the peak of the huge metal cross. The third Sunday of the Lent is called Adoration of the Cross. This is the day, on which we worship the Christ's Cross, and we recall the voluntary suffering and the redeeming deed of valour of our saviour Jesus Christ. 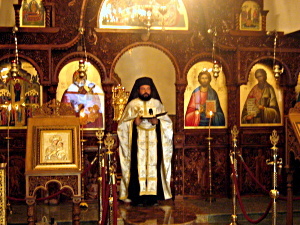 On Sunday, 30th march 2008, the bishop Nicolas from Plovdiv in a co-service with Bishop Antonius sanctified the renewed church "Cerement of the Holy Virgin Mary" in the monastery "Holy Trinity" at Cross forest. The adoration of the Cross Sunday is in the middle of the Lent. That's how the Church reminds the believers about the golgothian sufferings and death of the God-human and inspires and strengthens them till the end of the Lent. That's how the Holy Cross announces the infinite love of God for man and for the whole world and appeal us more concentrated and deep, rather than the rest non-lenting time, to think about the secret of this love. On the adoration of the Cross Sunday, the Holy Cross is carried out thru the Holy altar and is situated in the centre of the church. There the worshippers could make their adorations for the Cross. Like the traveler, tired from the long way, rests beneath the shady tree, that's how the orthodox Christians, traveling to the heavenly Jerusalem - Passover (Easter), find on the halfway the cross tree, so they can gain their strength back in it's beneficial shadows for the rest of their spiritual journey. The Friday liturgy is the one and only in Bulgaria, which is served during the night, the way the monks did in the old monastery. Back then, there were festive processions with a chest containing a piece of wood from the Holy Cross, from Cross forest to the Bachkovo monastery and back. The service took place on Saturday’s eve, in honour of the taking down the body of Jesus Christ from the cross. So we follow that old tradition and serve only during the night - at Saturday's eve, and on Sunday the service are in the morning between 9 and 11 'o clock.